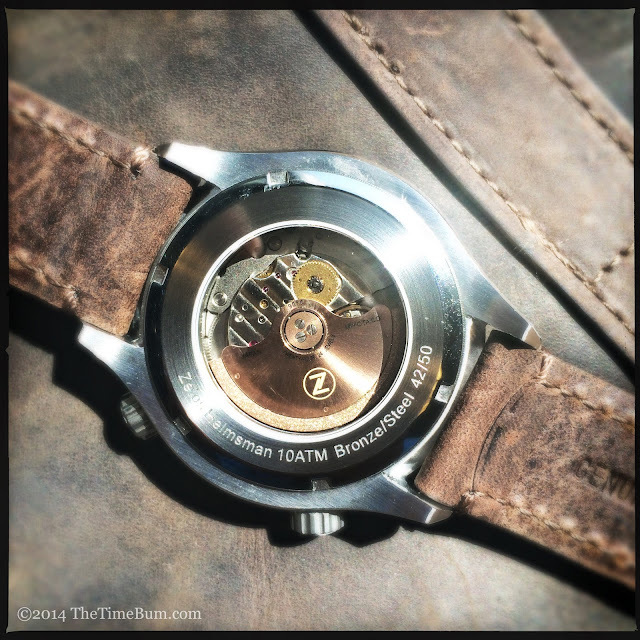 Back in March, I told you about the Zelos Helmsman, a new Kickstarter project for a dual crown watch by Elshan Tang. 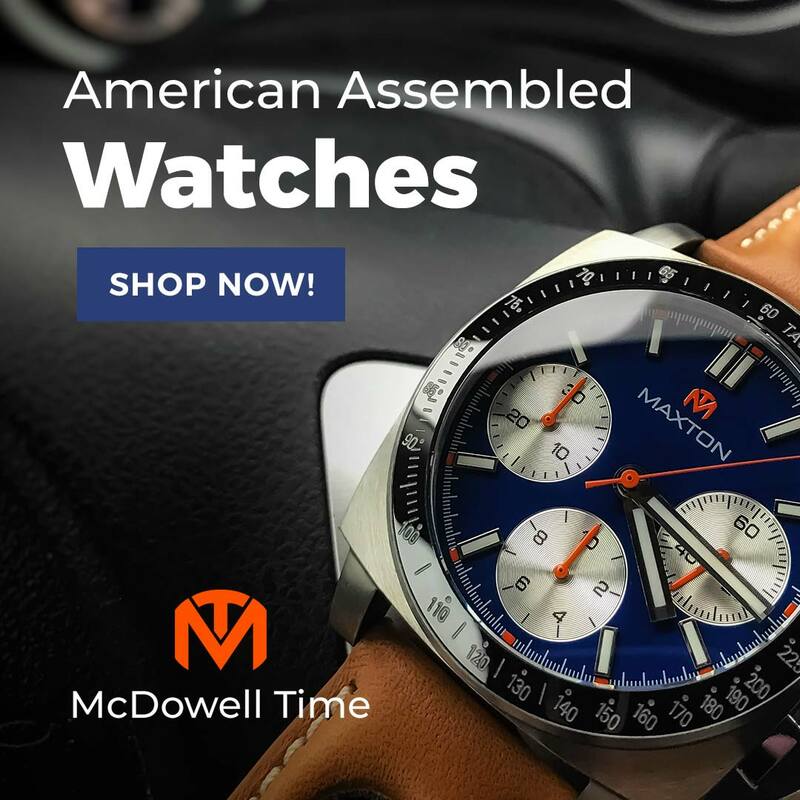 I liked the layering in the dial, the multiple finishes on the case, the Miyota 9015 automatic movement, and the outstanding pre-order pricing that started at about $340. It thought it showed a great deal of promise and was eager to get my hands on one. Apparently, I was not alone. Zelos raised almost $82,000 in the funding campaign, shattering the $30,000 goal. Watches are now being shipped, and Elshan was good enough to provide The Time Bum with a stainless case, grey dial Helmsman for review. 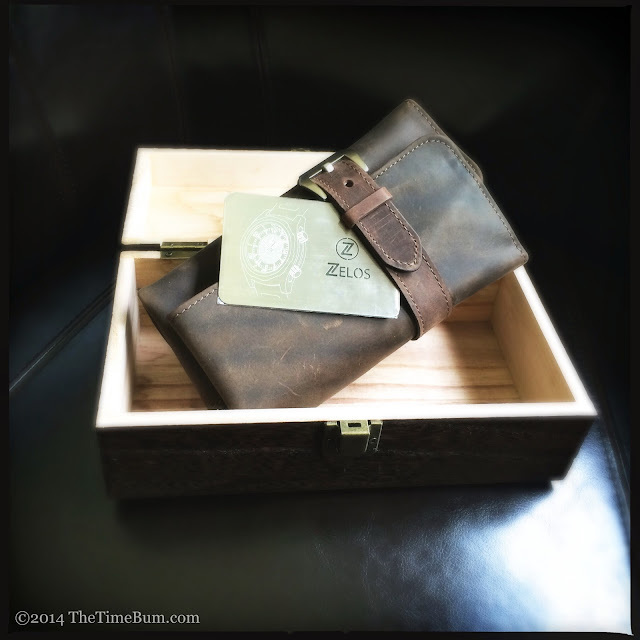 The watch arrived in a dark wooden box with the Zelos logo on the lid. 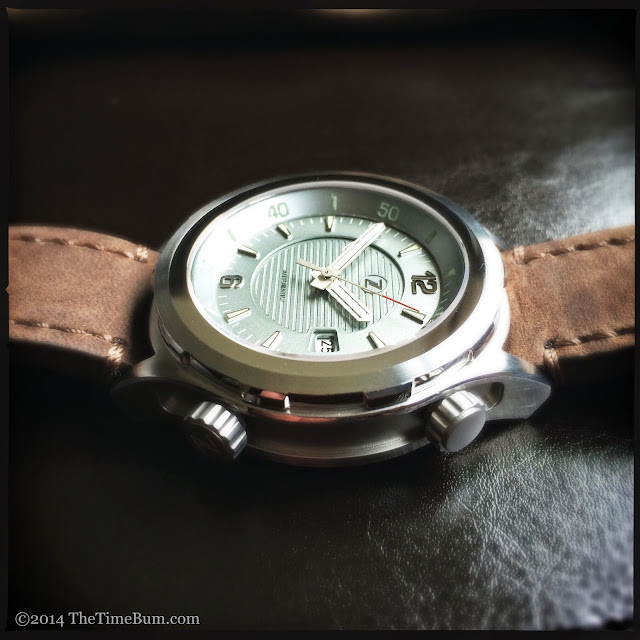 It is nice enough and protects the watch in transit, but it is not where the packaging and presentation money went. That part becomes apparent after you open the box. Inside is a sturdy, oil tanned leather watch roll. I have no use for display boxes, but the watch roll would be a welcome addition. It has four pouches for watches or straps and one for a tool. 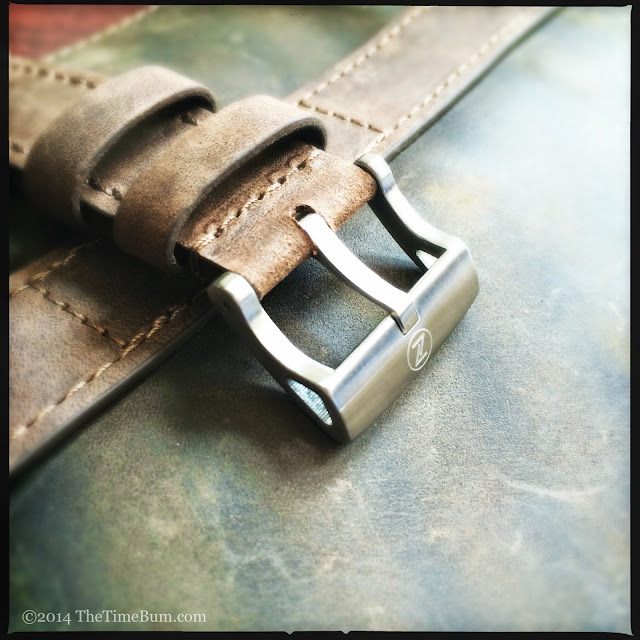 The roll is rather cleverly secured with a 22mm strap and Pre-V style stainless steel buckle. The leather looks and smells great, but that it picks up creases, marks, and scratches very easily. This is simply the character of the leather, not a flaw, but something to bear in mind. It is not supposed to look new forever, and that patina is going to develop very quickly. The roll contains an engraved warranty card, the watch, a black NATO, and a strap changing tool. I have amassed a small collection of "free with purchase" strap tools, and generally found them useless: weak heads, forks too thick to slip between the strap and the lug, flimsy plastic barrels, etc. This one is the exception. 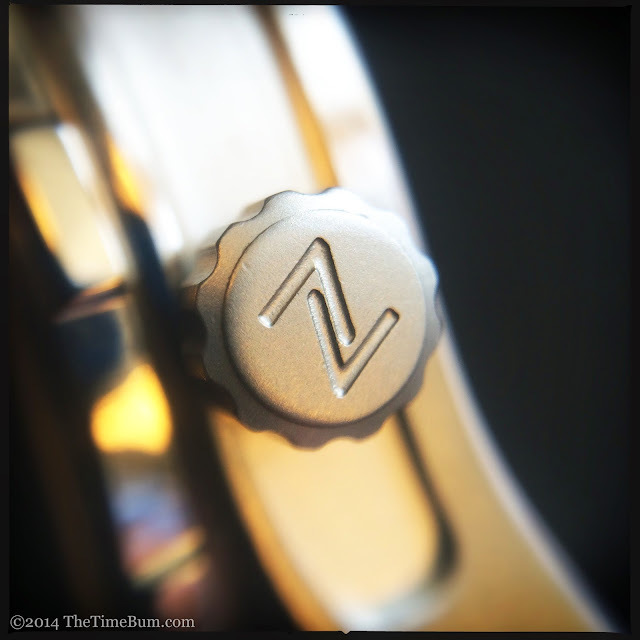 It is all stainless steel with a knurled barrel and replaceable screw-in heads. In fact, it is identical to the tool I purchased for myself a couple of years ago. This is a sizable watch. The brushed stainless steel case measures 43mm wide, 50mm tall, and 14mm thick with slim, tapered lugs. Thick watches run the risk of appearing bulky and slab-sided, so I like it when a designer takes steps to minimize the girth. This can be done in many ways such as adding a contour or character lines, beveling or radiusing the edges, or smoothing the sides with a complex curve. Elshan took an approach I have not seen before and cut deep recesses with filleted corners into the length of the case sides, then set them off by sandblasting the interior surface. It is unique and attractive, breaking up the sides and quite literally adding depth. The bezel is beveled and polished on the outer edge and innermost surface. The beveled edge is brushed. The multiple finishes and contours certainly work, at least to The Bum's eye, drawing attention, but also breaking up the mass, allowing the watch to wear slightly smaller. The dual crowns are large and aggressively grooved. Both screw down and the lower crown is signed. They are easy to grip and operate with a positive, mechanical feel. The outer bezel is unmarked and despite the shallow notches that surround it, it does not turn. That job is reserved for the inner bezel with its 60 increment index. It is angled towards the dial and adjusted by the upper crown. It moves easily, but I did notice that resistance increases in certain places as it makes its way around the dial. 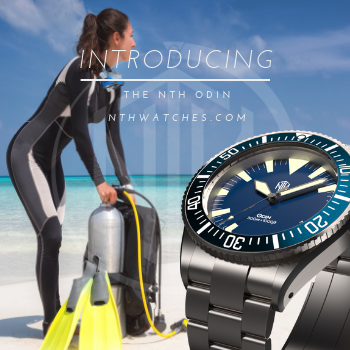 The hefty case, dive bezel, and dual crown design suggest a dive watch, but the Helmsman is only rated for 100m water resistance. I would call it a sport watch, and certainly water friendly, but you should not use it for scuba or other serious marine activity. Best to keep it at the helm. A sapphire crystal tops it all off and out back you will find an engraved display case back that showcases the Miyota 9015 movement. Zelos has taken an extra step here by decorating the rotor with rose gold PVD coating and an engraved logo. This 24 jewel, 28.8k BPH movement is smooth, reliable, highly accurate, and affordable, making it an appealing alternative to the pricy ETA 2824. It makes its presence known on your wrist as you can both hear and feel the rotor swing as you move. The Helmsman is available in several variants, including black, brown, green, and blue dials, and bronze and bronze with DLC black bezels, in addition to the stainless/grey combination here. It is easy to overlook the relatively monochromatic combination here, but that would do it a disservice. 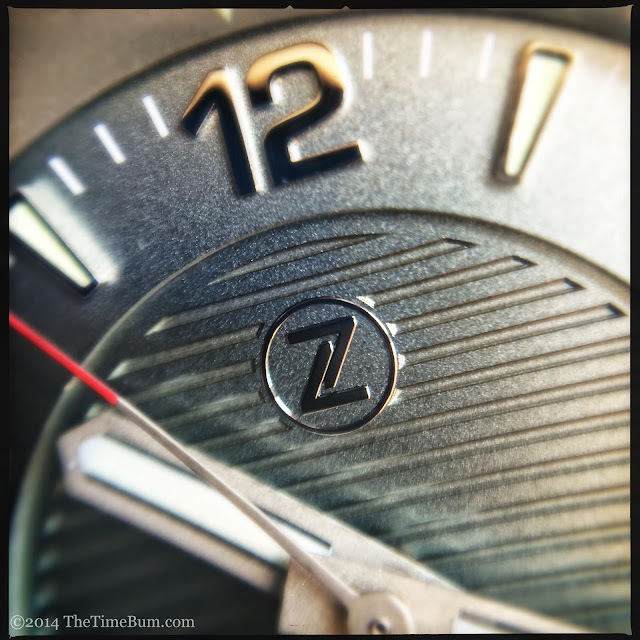 The grey dial does not shout for attention, but it commands it. Multiple layers are a play on the face starting with the aforementioned internal bezel, then the applied dart markers and Arabic numerals at 12 and 6 o'clock. From this level, the dial steps down to a second layer at the center that is textured with horizontal bars that wrap around the 3 o'clock date window. 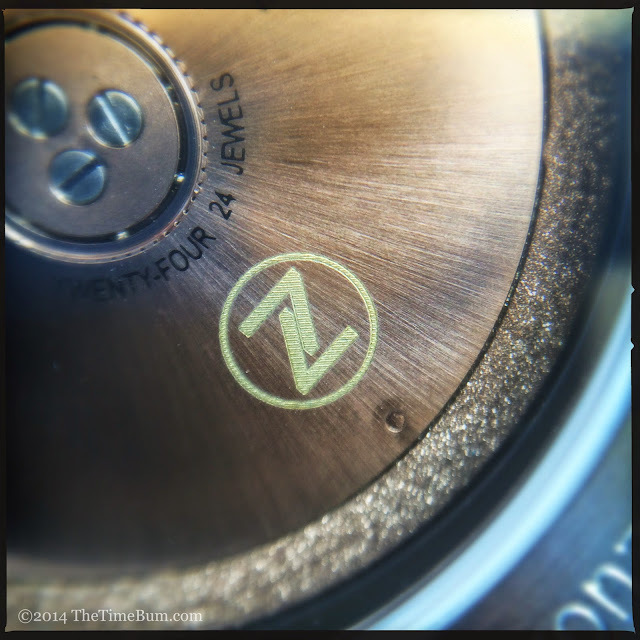 The Zelos logo occupied the top the dial, the word "automatic" at the bottom. Brushed and semi-skeletonized sword hands add yet another dimension as the dial peeks through the channels that run their length. Depending on the light, color changes and details emerge and recede. It is a rich effect, and highly attractive. It makes me wonder how it might look if the silver toned color was continued with a stainless steel bracelet. 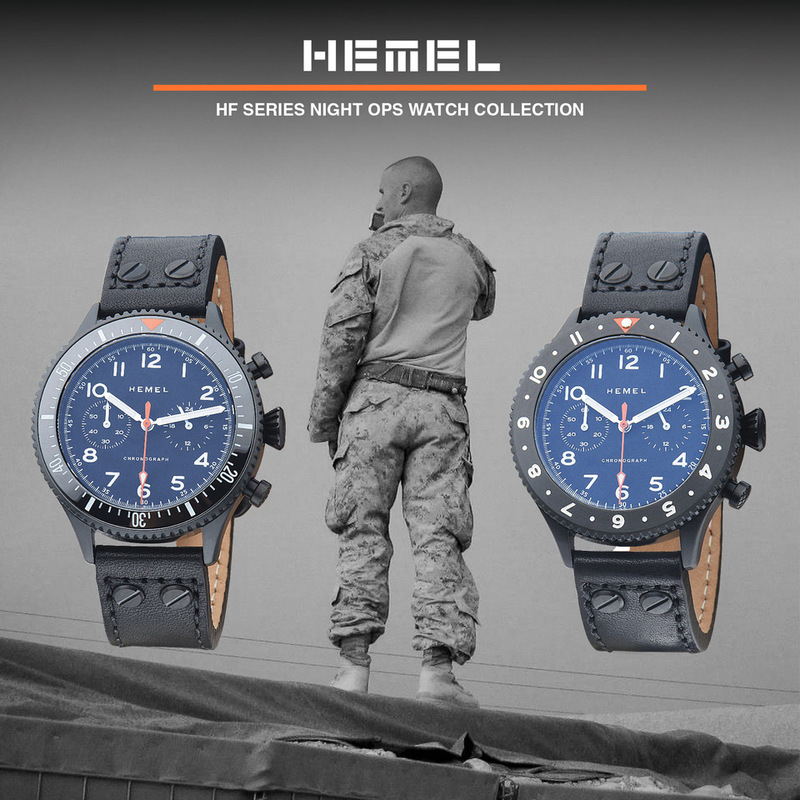 The darts, hands, and bezel index are all treated with C3 SuperLuminova for excellent nighttime readability. As it stands, the Helmsman is only offered with straps, but they are in no way lacking. First is the black nylon NATO, which is perfectly fine, and a staple of every watch nerd's wardrobe, but nothing to write about. I found it to be a shade too thin for the watch, making it appear slightly top heavy. 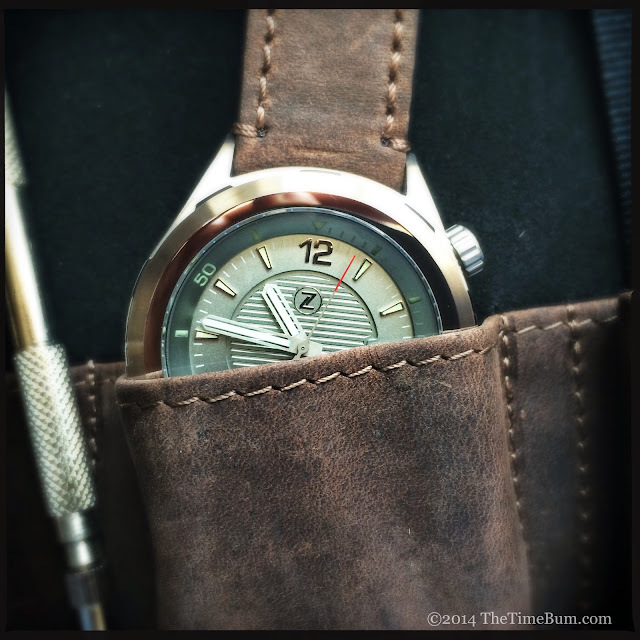 The second is a thick, oil tanned, matte finish brown that matches the watch roll. 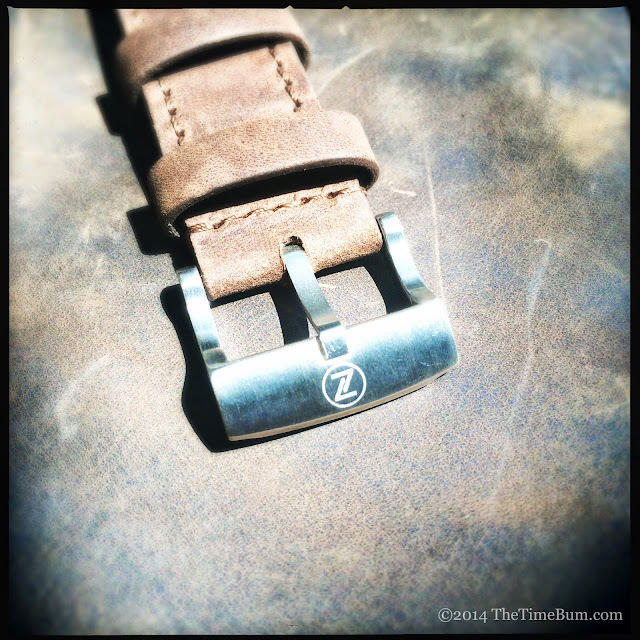 This is a beautiful strap, well made and properly proportioned for the watch. Much to my delight, it fit my smallish 6.5" wrists easily with more room left for adjustment. 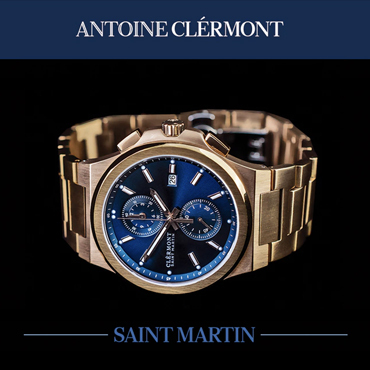 It is secured with an engraved stainless buckle that is just as intriguing as the watch case. It has a square frame with a pronounced "S" curve in profile and cut outs through the sides that recall the recesses in in the case. 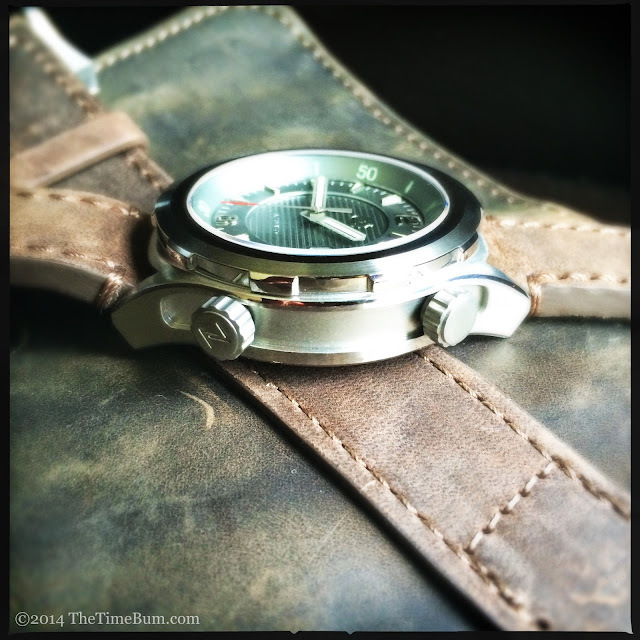 It is a perfect accompaniment for this rugged yet stylized watch. A third, dressier black leather strap will also be included, but it was not ready at the time of shipping. I expect the watch would look quite nice on a more polished strap, but the size of the watch precludes its use with a suit. I could, however, envision it with a coat and tie in a less formal setting, and on a larger wrist than my own. Overall fit and finish is very high, but there are one or two flaws that betray its freshman status. I noticed some splatter of lume around one of the bezel numbers, but this was only visible with a loupe and if a flaw is not visible to the naked eye, I do not consider it to be an issue. I also questioned alignment of the logo under the 12. It appears to be ever so slightly off to the left. I examined this until I was dizzy, then checked photos of the dial on line, and determined that it is not a misalignment at all but an illusion. This is most likely because my brain is attempting to line up the logo with the narrow stem of the 1 and broad base of the 2, and not registering the large serif at the top of the 1, which also comprises the total width of the 12. It can drive you crazy if you dwell on it, so my advice is not to dwell on it. 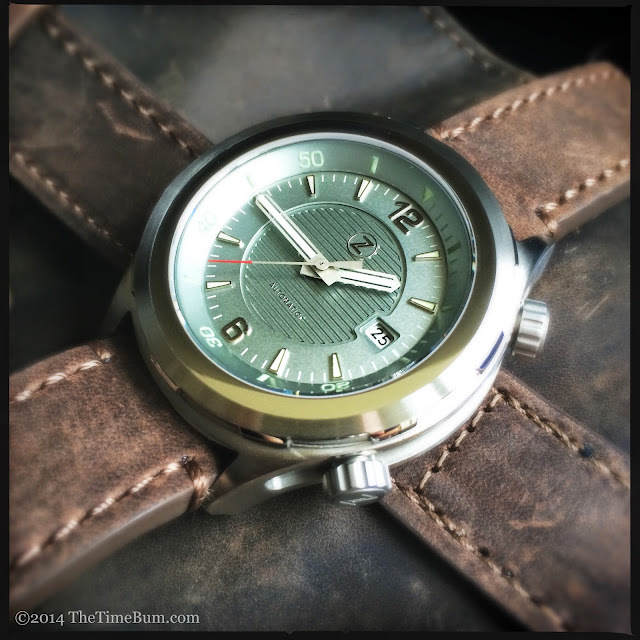 A stainless steel case Helmsman now sells for $420. That would be a fair price for the watch, but it is exceptional when you consider the extras. The watch roll alone would likely cost about $100. The Helmsman is an ambitious design with myriad elements competing for your attention. I knew it was complex from the prototype photos, but I did not truly appreciate it until I could hold one in my hand. 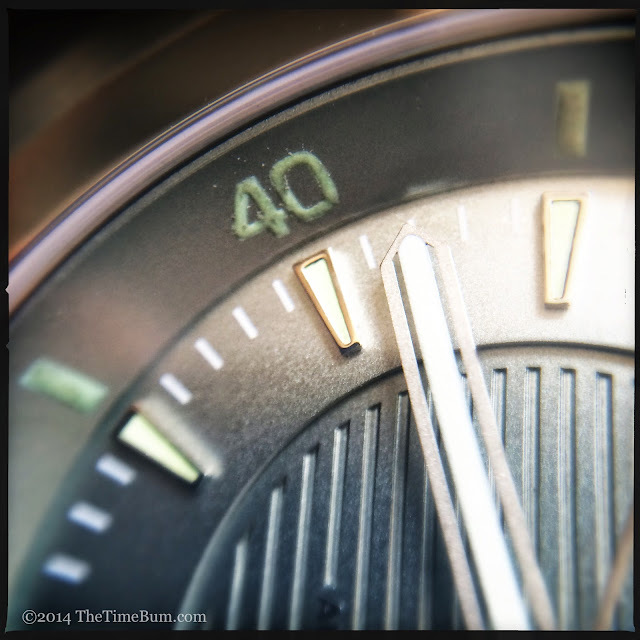 In the hands of a less competent designer, this watch could have been a hot mess. Instead the design is brilliantly executed. It is clearly the work of a talented individual who loves watches. I really like the Helmsman and I look forward to Elshan's next project. Pro: Complex and satisfying design. Con: Minor quality control issues. Sum: A brilliant start for Zelos. The Time Bum approves. 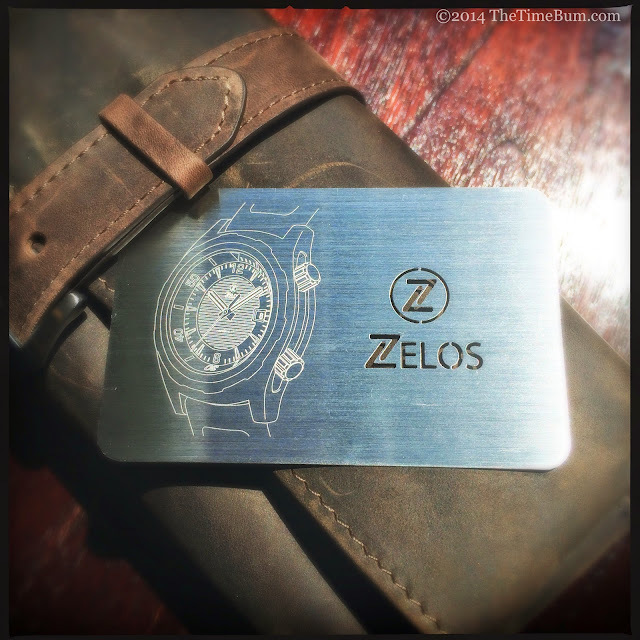 GIVEAWAY: Want to win a Zelos Helmsman of your very own? How about the very one reviewed right here by the beloved Bum? Then check out the giveaway post here, and enter before 11:59 pm US Eastern Standard Time on July 31, 2014. Good Luck!